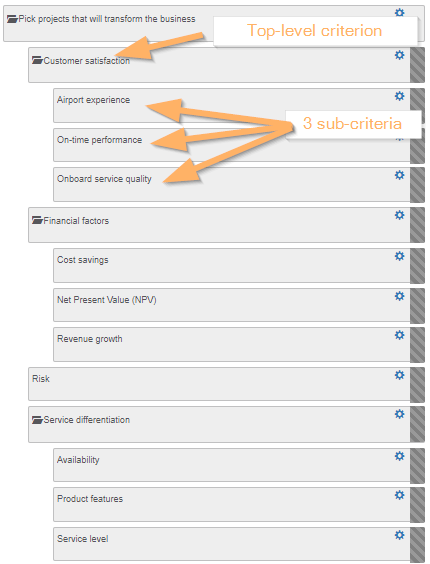 This image is a screenshot from TransparentChoice and shows the top-level criteria and how they are broken down into sub-criteria.This example is for an airline. You can see that the goals of improving “Customer satisfaction” is made up of three sub-criteria. Having a “starting list” can really help the brainstorming process and that’s why we’ve created an e-book on the topic with over 80 sample criteria. The book won’t give you “the answer” but, hopefully, it will give you inspiration and help you get a better result. Now you’ve captured your business goals, it’s time to turn them into weighted criteria. In reality, your business goals are not all equally important. Weighting lets you both capture that fact and quantify the differences. Your stakeholders will all perceive the goals differently and would weight them differently. If you don’t go through a structured process that lets them come to agreement on the criteria weights, they won’t support the portfolio you come up with. Your weighted criteria are an excellent communication tool. By sharing your weighted criteria with the whole team, you are communicating what’s important and you are empowering people to make decisions aligned with your priorities. Building a “weighted criteria model” that you can use to score projects is, frankly, the most important step in the whole process. If your stakeholders don’t buy-in to your model, they will try to find ways “around” it. They will try to promote pet projects, they will try to add “just one more project”, they will try to “shout louder” to get their project done. What you NEED TO KNOW, however, is that PPM tools typically don’t use AHP. They assume that criteria weighting happens “by magic” and this is why portfolios picked this way continue to suffer from high project failure rates. The AHP process is very simple. Your stakeholders answer questions comparing PAIRS of criteria. 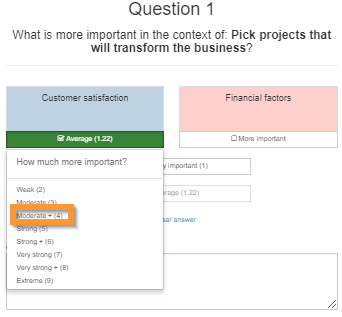 In the example below, your stakeholders are being asked which criterion is more important, Customer satisfaction or Financial factors. Each stakeholder answers the question independently and indicates how strong their preference is. Once everyone has voted, you look at the votes and see where there is agreement and where there is disagreement. In the example below, two executives agree that Financial factors are more important (the square) while one disagrees (the circle). This difference is visible which means the team can have a quick conversation about why they disagree and can come to an agreed position. This process really adds value for the executive team; they are learning from the discussion and they are coming together on a joint vision of what’s important. In other words, we’re achieving the all-important improvement in both decision quality and buy-in. The result of process is a set of weighted criteria that everyone supports. You can use this to communicate your priorities to your team and, of course, to select projects. In parallel to criteria weighting, you need to pull together a list of all your projects and all your project requests. Together they represent the “possible projects” for your future portfolio. In project-land, this process is usually called “Demand Management”. Many organizations do this in a spreadsheet, but this can be a little messy. The data needs to be aggregated and sorted. In fact, it’s good practice to formally create stage-gates for projects and project requests. You might, for example, have a step for initial validation followed by a step for estimating financial impact. Assuming the project still looks good you might go on to assess strategic alignment, then estimate the project size and so on. At each stage, you are adding information and, naturally, this includes scoring each project against your criteria. Again, TransparentChoice software can make this process much quicker and easier. You can define your stage-gates in a Kanban format, set up automated notifications and can send online forms to your “experts” to help capture the data you need. This 2-minute video will give you an idea of what it looks like. Now it’s time to do some maths! 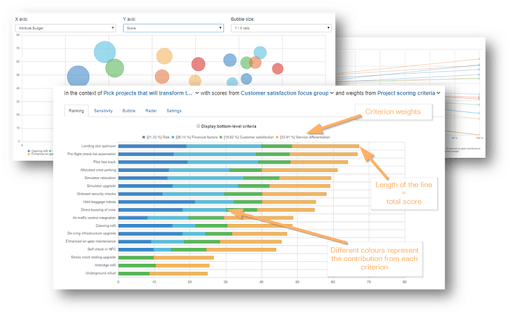 This is where you bring together your weighted criteria with the project scores to give you an overall score for each project. We have put together a sample spreadsheet to show you how the calculation works. NOTE: For this to work, you need to make sure all your criteria are scored on the same scale (e.g. 0 to 100) or that your scores are “normalized”. Now you are ready to present your ranked projects. In your spreadsheet you can simply order your projects based on their weighted score - the higher the score, the more “value” that project will deliver to the organization. 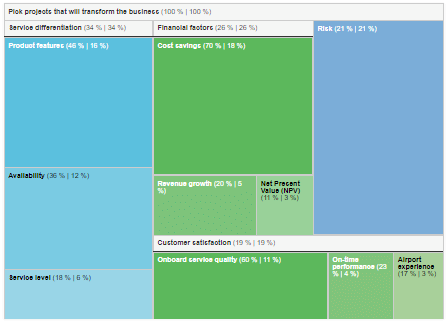 Using prioritization software will make the process quicker and easier and will give you additional analytics and tools to visualize the prioritized projects. Now you can start to use your prioritized list to support the decisions that will help make your projects successful. Having clearly defined strategic goals and well-prioritized projects aligned with those goals is the foundation upon which the success or failure of your portfolio rests.